Trump has encouraged US allies to maintain sanctions on North Korea until it denuclearizes to maintain a campaign of pressure against Kim's government. Seoul: The rival Koreas are holding high-level talks Monday to discuss further engagement amid a global diplomatic push to resolve the nuclear standoff with North Korea. South Korea said Monday’s talks will be aimed at finding ways to carry out peace agreements announced after the summit last month between South Korean President Moon Jae-in and North Korean leader Kim Jong Un in the North Korean capital of Pyongyang. The meeting between senior officials comes at a sensitive time as Washington has expressed unease over the fast pace in inter-Korean engagement, which it says should move in tandem with U.S.-led efforts to denuclearize the North. 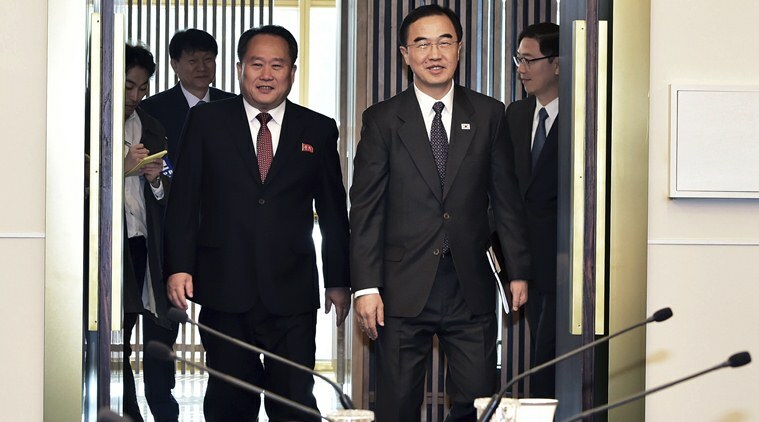 South Korean Unification Minister Cho Myoung-gyon said the discussions will include setting up a joint survey of a North Korean railroad section the Koreas plan to connect with the South. The North’s chief delegate to the talks is Ri Son Gwon, who chairs the North Korean agency that deals with inter-Korean affairs. “The infinite waters of the Pacific and the Atlantic start out as a gathering of smaller repositories of water,” Ri told South Korean reporters as he arrived at the border village of Panmunjom for the meeting. “Likewise, the high-level meeting today will contribute to peace, prosperity and unification (between the countries) that are desired by the entire nation,” he said, referring to the people of both Koreas. In their third summit this year, Moon and Kim committed to reviving economic cooperation when possible, voicing optimism that international sanctions could end and allow such activity, and holding a groundbreaking ceremony by the end of the year on an ambitious project to connect their roads and railways. However, South Korea’s enthusiasm for engagement with its rival appears to have created discomfort with ally United States amid growing concerns that the North is lagging behind its supposed promise to denuclearize. Moon’s government last week walked back on a proposal to lift some of its unilateral sanctions against North Korea following President Donald Trump’s blunt retort that Seoul could “do nothing” without Washington’s approval. South Korea’s Foreign Minister Kang Kyung-wha also said US Secretary of State Mike Pompeo had expressed displeasure about the Koreas’ military agreement. Kang was not specific but her comments fueled speculation Washington wasn’t fully on board before Seoul signed the agreement. Trump has encouraged US allies to maintain sanctions on North Korea until it denuclearizes to maintain a campaign of pressure against Kim’s government.